The day after Apple released iOS 6, I was at a Giants game in San Francisco, trying out the Passbook integration ginned up by the MLB and Tickets.com. I loved it. It was a seamless experience, and you could tell that there was a ton of thought put into how to make it work right. Now, the regular season is over and the MLB’s two-week experiment with Passbook is over, so how did it do? To get more background on how the trial went, I spoke to Senior Vice President of Wireless at MLB Advanced Media, Adam Ritter. The gist of the conversation? So far, so fantastic. In the two weeks that the Passbook program was in place at four Major League ballparks, Passbook accounted for 12% of sales of single game tickets purchased online, around 1,500 in total. Those numbers seem pretty darn impressive, the parks are not minor ones, and that’s a decent chunk of ticketing. But they get even more impressive when you think about the breakdown. That 12% is only two weeks, only counts online purchasers who chose to deliver to mobile users, who were iPhone owners, and those that updated to iOS 6 (which was only available on the 19th of last month) within that period could take advantage of Passbook. I think its very safe to say that percentage is going to get a lot higher next season, when the MLB rolls out Passbook support to many more parks. The four ballparks included Citi Field in NYC, AT&T Park in San Francisco Fenway Park in Boston and Kauffman Stadium in Kansas City. Those parks were chosen for a variety of reasons, among them that they were being served by MLB subsidiary Tickets.com, who worked hand-in-hand with MLBAM to get the logistics of the integration worked out on the ground. Because that’s the key component of Passbook that a lot of companies are underestimating. Getting the backend support and software workflow right is super critical, but the on-the-ground logistics of getting those passes scanned in a painless way and integrating them with existing ticketing systems is a major component of the success that the MLB has seen thus far. The TDC team, Ritter told me, was instrumental in getting the scanners installed at the gates of the parks, training staff and figuring out all of the quirks to the system. The scanners at AT&T Park, for instance, are attached to printers which give you a paper stub. That stub can be handed to an usher to check your seating session or be redeemed for deals if they decide to spin those out at some point. 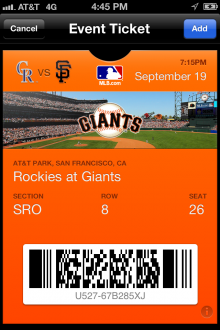 MLBAM had been working closely with Apple to get the Passbook integration ready for this trial. 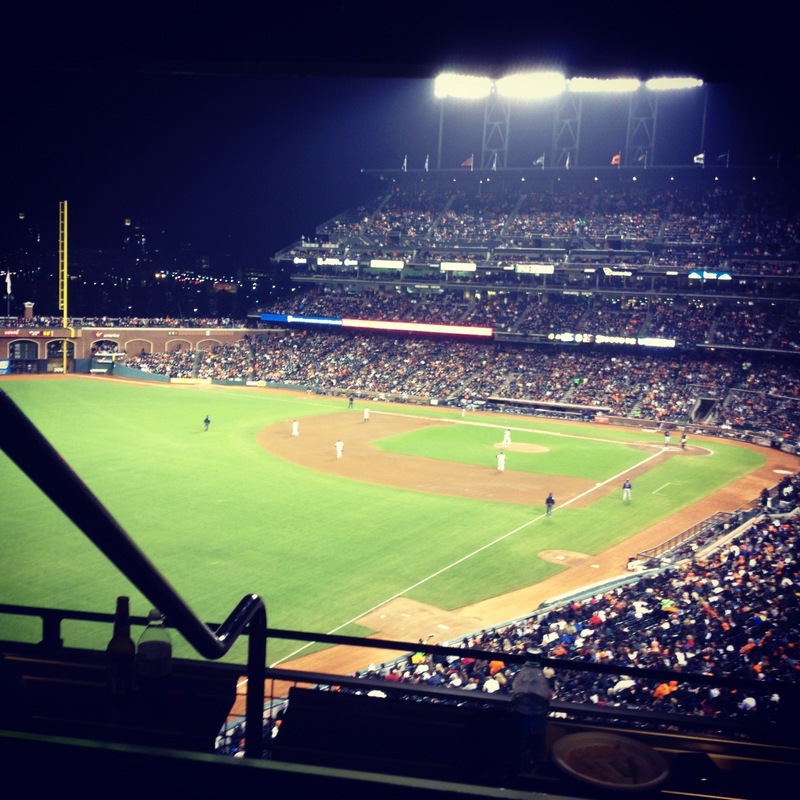 In fact, they already had scanners in place at AT&T Park 2 weeks before iOS 6 officially dropped and were testing the integration on the fourth beta release. This was done to get the system into place and to figure out how to route customers to proper scanners. Ritter cited the ubiquity of Apple’s iPhones, of which the majority already run iOS 6 as one big plus. The comfort of the Passbook system is also important, because there is a psychological advantage to having a ‘real’ ticket, rather than a link in a text message. Connectivity, Ritter told me, is also a major plus for Passbook. Because the tickets are delivered to and stored in the Passbook app, there is no need for a customer to tap on a link and wait for a page to load under poor network conditions or fumble around in emails to figure out where they left the tickets. Ritter says that the MLB have been offering mobile ticket sales for five years, delivering them via SMS or links in emails, but Passbook already looks like it’s going to lift mobile ticketing for the organization overall. MLBAM hopes to roll out Passbook support to a bunch more parks next season, and they’ve already integrated it into their At Bat and At The Ballpark apps. Now, it’s up to them to use the off-season to finesse the Passbook system and have it ready for opening day.